Color Display & Touch Screen: It is fast, easy, safe, and fun to use. It's instant read unlike traditional ones take a while to register temperatures. It has a backlit LCD displays which make it convenient to use at night and helps you get a quick reading at a glance from any angle. WEKSI grill thermometer itself comes with two strong magnets and a stand on the back. Easy to attach on the fridge, oven, smoker or put on the table. Powered by 2 AAA batteries which is not included. Accurate Themometer & Timer: The thermometer will beep when the probe hits the set temperature. Easy to switch, the display shows the temperature in Celsius or Fahrenheit. You can select the preferred temperature scare by touching the "S/S" button. The display reads "LLL" if the probe doesn't plug in. It reads "HHH" if the temperature is higher than 482°F. BBQ Grill Oven probe: The food grade stainless steel probe is heat resistant and can be used for BBQ, grillbaking, roasting, frying, smoking and oven- cooking etc. The stainless steel probe range is from 32°F to 482°F:(0°C to 250°C). 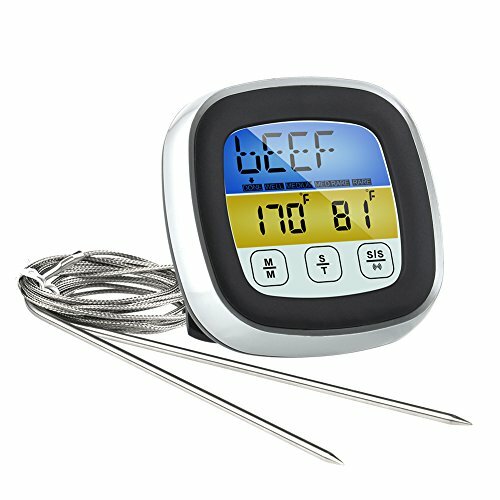 Meat thermometer range: -10°C to 250°C(482°F).